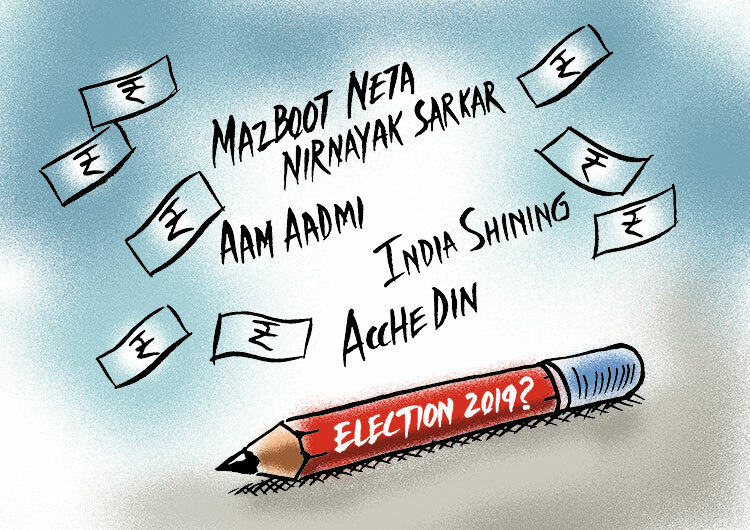 Rediff.com » News » What's next after 'Acche Din' in 2019? 'It is unlikely that there will be an 'achche din'' style slogan either from the government or the Opposition,' says Aakar Patel. What will be the issue that the 2019 elections will be fought on? The polls are about a year away and in a few months from now the parties and alliances will have finished positioning themselves. They will go to advertising agencies and polling agencies and marketing specialists to figure out how to package and distribute the most effective message. The advertising company Ogilvy & Mather was hired by the BJP for its successful 2014 campaign while the Congress had hired J Walter Thompson. The first time that an advertising agency was used in Indian politics so far as I can remember was in 1985, when Rajiv Gandhi hired Rediffusion. This time again, politicians will be in meetings with men in suits making powerpoint presentations that attempt to frame a message that most appeals to the citizen. Just like yeh dil mange more and yeh andar ki baat hai and achche din aane wale hain, marketing geniuses will produce catchy slogans to dominate the narrative. The BJP reported to the Election Commission that it spent Rs 714 crore (Rs 7.14 billion) on the 2014 campaign. The Congress spent Rs 516 crore (Rs 5.16 billion). Single state parties like Sharad Pawar's NCP reported spending Rs 51 crore (Rs 510 million). Expect these numbers to double or triple in 2019. And this does not include what will be spent in cash by candidates or spent by companies on behalf of the parties (a common practice in India). The major candidates will easily spend Rs 15 crore (Rs 150 million) each and that does not include the cost of the ticket. All in all, my guess is that at least Rs 25,000 crore (Rs 250 billion) will change hands before May 2019. If you think this number is incredible, the Economic Times quoted a study which estimated that Rs 5,500 crore (Rs 55 billion) was spent on the Uttar Pradesh election of 2017. Newspapers and television channels will get additional income from political advertising, much of it pretending to be news. Many deals will be done and as the Nirav Modi scandal shows, corruption does not begin or end with a non-corrupt leader. Political parties will also unemotionally assess and work out what alliances will give them maximum advantage. Some leaders will leave their options open, giving up advantage in the beginning in anticipation of greater benefit and flexibility later. The results from four states going to elections before 2019 -- Karnataka, Madhya Pradesh, Rajasthan and Chhattisgarh -- will help many regional parties decide how close or how distant to be from Rahul Gandhi. The reasons for the Bharatiya Janata Party's spectacular electoral successes over the last six years will now be fully understood by its rivals who have sized the party up properly. That is what has made the most unlikely of partnerships, such as the one we saw in Uttar Pradesh between Mayawati and Akhilesh Yadav, possible. That will depend on who will control the narrative. In 2014, it was the Opposition leader that controlled the narrative and not the ruling party. The Congress was forced to defend its record on corruption and the BJP batted from the front foot on the presumed capacities of its leader. In 2009, the BJP hired two agencies Frank Simoes-Tag and Utopia to produce a campaign projecting L K Advani as a strong leader. The slogan was 'Mazboot neta, nirnayak sarkar' to show Manmohan Singh as indecisive, which, of course, he was not. The Congress in that year hired JWT, which produced the 'Aam Aadmi' slogan, which was later, of course, appropriated by Arvind Kejriwal. Sometimes the dominant narrative of the campaign does not result in the victory. Atal Bihari Vajpayee's 2004 campaign -- 'India Shining' designed by the agency Grey Worldwide -- resulted in a defeat nobody predicted and for reasons nobody still fully understands. It does not appear to me that the campaign of 2019 will be positive. By that I mean it is unlikely that there will be an 'achche din' style slogan either from the government or the Opposition. The economy is not doing anything particularly special and I do not think our lives as citizens are in any noticeable way different than they were in 2014. I was speaking to a BJP leader a few days ago and was told that the Ayodhya issue will be brought into focus sharply. At the moment the BJP is not touching it, but that could change very soon. The Supreme Court is hearing the case and it is possible a verdict will come soon. A few days ago, the court dismissed the applications of individuals like Subramanian Swamy who were seeking to intervene in this matter. Want to know BJP's 2019 Poll Mantras?